The next time dads are looking for a boost in intelligence, it may be best for them to lace up their running shoes instead of opening up a book. A growing body of research suggests that in addition to improving one's physical health, cardiovascular exercise might make people smarter, Men's Health reports. There is a great deal of evidence that supports the findings. Its no surprise that most successful men adhere to a strict exercise regimen that emphasizes running. Richard Haig is the CEO of his company, and he credits his ability to grow his worth to his running. "It's no coincidence that I've done more to increase the company's value in the past 2 years than I had in the previous 10," he told the publication. While the testimony of several powerful men may have some skeptics questioning the connection, study after study has supported the idea. At the University of Illinois, researchers used an electroencephalograph to monitor brain functions during the test subjects' 30 minute sessions on a treadmill. 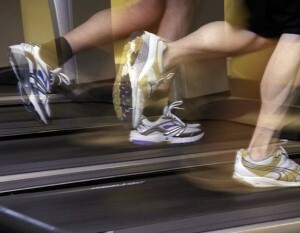 What scientists found was that during exercise, brain activity related to memory and focus tends to increase. Dads who want to stay sharp and get ahead in the workforce should think about going for a run. They'll be as smart as they are healthy – and their kids are sure to reap the benefits.